Swarovski's Cupchains and Findings is a broad category that includes a number of notable and popular sub-categories. The products in this broad category are metal chains and findings that integrate the Round Stones or the Fancy Stones. All of them are offered in a large variety of shapes, sizes, colors, and platings. Please refer to the Swarovski Round Stones color chart (.pdf) as a guide. Whatever colors/effects not on that chart will also not be available for any of the products under Cupchains and Findings. However not every color on the color chart will be available for every product in this category. Please contact me or your own Swarovski supplier for confirmation of colors for any specific product within this entire category. For the pearl components in these products, please refer to the Swarovski Crystal Pearls color chart (.pdf). Again, confirmation with your Swarovski supplier is recommended. 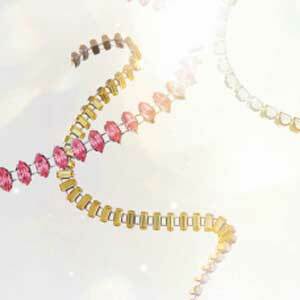 Swarovski Cupchains and Findings offer a dizzy-fying array of brilliant choices. Unfortunately they are not as well known as the Swarovski Beads, Pearls, and Stones. That is a big loss to the hobbists, craftsmen, and jewelry artisans in general as this range opens up incredible new doors of unprecedented brilliance and variety. Single Stone Settings are Round Stones or Fancy Stones that are set in a metal cup. They are available in a variety of ring combinations as well as back configurations. Single Stone Settings come in a wide range of shapes and sizes. DIY Findings are also part of this product group. Swarovski Cupchains are metal chains that integrate the Round Stones or the Fancy Stones. Cupchains are offered in a large variety of shapes, sizes, colors, and platings. Swarovski Multi Stone Settings incorporate Round Stone or Fancy Stones. They are set in special metal forms (e.g. hearts, circles, or navettes). Stretch Bracelets are also a part of this group. Swarovski Fancy Multi Settings are Round Stones or Fancy Stones that are set in special metal cups (e.g. crosses or balls). The Rondelle Balls are also part of this group. Swarovski Channels are single Round Stones or Fancy Stones without foiling that are fitted with a metal ring around the girdle of the stone. This gives the channels its typical feature: the viewer is able to look "through" the Round or Fancy Stones. Swarovski Metal Buttons and Filigrees are Round Stones or Fancy Stones that are combined with metal components to form the shape of a Button or Filigree. Filigrees, starting with article number 62000, also include Beads and Pendants and shapes like flowers, crosses, or stars. In addition, these special products are also available with antique gold, and antique silver plating. Swarovski Rondelles are Round Stones or Fancy Stones with metal parts and they are often used as "spacers" between Beads or Crystal Pearls. The XILION Square Rondelles are also a part of this group. 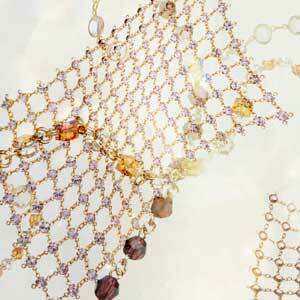 Swarovski Linked Findings incorporate Channels and Bead Chains, and the Crystal, Channel and Pearl Web. Exclusive Channel and Bead Chains (denoted with the letter "A" in the article number) represent an even higher processing quality than the standard Channel and Bead Chains. The Crystal, Channel and Pearl Webs are combinations of loose crystals with metal elements. The can be ordered in sheets or by the metre. Pearl Webs (art. 98003, 99003) are not available in Sterling Silver Plating. 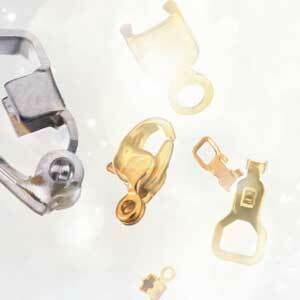 Swarovski Brass Components are end fasteners that match Swarovski Cupchains on offer. Also offered are Lobster Claws for Channel Chains and Bead Chains. These all form part of Swarovski's Cupchains and Findings broad category.